Ah yes …. Love! Valentine’s Day. For me, it’s a mix of anticipation and trepidation. I think most guys feel the same. Will she like the thing I got her? Was I romantic enough with the things I said and did? Did I acknowledge her in a way that is worthy of her? Why am I wandering around asking so many questions about it? I missed Valentine’s Day once. My sweetheart and I live at distance from each other, so we were in two different cities at the time. Perhaps, more accurately, I kinda’ walked by Valentine’s figuring, well, I’ll be there soon, so I can take care of things when I see her. DUMB, DUMB, DUMB. And dumber, yet. Have I repeated this offence? Nope. If you are a woman reading this, I will pause to allow your volley of “What were you thinking?” to play itself out. Feel better now? And, yes, I deserved it. So, let’s move on, shall we. Time to pivot. For Valentine’s Day 2017, Cashco Financial ran a contest called “The Name Game”. Very simple, really. 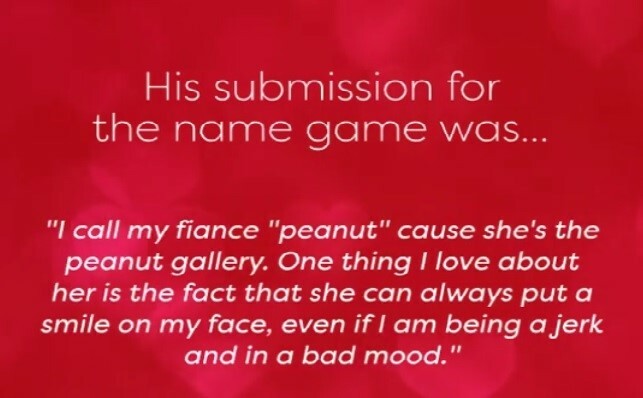 The ask was to provide a pet name for your significant other and one thing you loved about that person. The winner, Jamie from Calgary, Alberta, won the contest with the following. For his efforts, Jamie received a $250 VISA gift card and movie tickets. 1800 love struck individuals entered the contest, so for the other 1799 out there, I will say this: assume you are a winner. You actually took the time to create the entry, submit it, and wait — filled with hope and anxiety. So here’s what you do. Take the entry and put it in a card. Tell your significant other that you tried and, even though you weren’t selected, you’re still going to take him or her out for a movie or dinner (or make dinner) or whatever floats your boat. Little things matter. It is one of the ways we communicate. Communication is one of the 5 key things to a successful relationship according to an article from the Huffington Post. There are 4 other keys to a successful, loving relationship: self-love, trust, honesty, and connection. Certainly not earth shattering news. But, after communication, self-love, is really an interesting kingpin (as I have learned). For the 1800 people who entered Cashco Financial’s Name Game, you proved one thing. You love yourself, even if, perhaps, some of you may not know it or even believe it. In fact, the proof of the fact that you love yourself is because you are loved by someone who inspired you to do one small thing: enter a contest. Really, you don’t have to enter a contest to be a winner in love. Of all the people you love, consider this as an opportunity to include one more person —- yourself. Happy Valentine’s Day from all of us at Cashco Financial.